You mean I have to practice to get good at this? “I didn’t have time to practice.” If I had a nickel for every time I’ve heard that I could probably retire. A common dilemma among music students both young and old, and in today’s society which is full of other distractions, it seems to be a growing trend. When investigating this dilemma, I usually find that it is not so much that one “doesn’t have time” as it is that one “doesn’t make time.” Unfortunately for most of us, practice is a necessary ritual that one must engage in to become proficient at playing guitar, or any other instrument. 1. Have a designated spot to practice and make time to do it. If you can walk into a room, sit down, and grab your guitar off a stand and play you will be more likely to pick it up regularly. 2. Practice for short periods of time a couple times a day. In the beginning, you may not have a lot of stuff to work on. Try practicing for 15 minutes or so and then come back to it later in the day and do it again. The repetition and consistency of doing it this way will help more than marathon sessions. It will be much more productive to spend less time consistently that it will to skip a few days and try and make up for it in a 3 hour practice marathon. Even if you don’t have 15 minutes, anything helps. Just getting the instrument in your hands a couple times a day will make a big difference. Eventually you will have your own list and you’ll know what you need to do. 4. Practice what you need to practice, but also practice what you like to practice. Most often what we need the most work on ends up being what we like to practice the least. Trust me, it happens to all of us. What we’re not good at is usually not a whole lot of fun to work on. Forge ahead. Put your nose to the grindstone and get it done. When my oldest daughter was in middle school band they had a workshop with a band called the Dallas Brass. One of the guys in the band had the best analogy I’ve ever heard when it comes to playing an instrument and it will always stick with me – “The more you practice, the better you get. The better you get, the more fun it is to play.” It’s so true. Playing what you love and knowing that you put in the hard work to get you there is one of the most rewarding things that you can do. See the light at the end of the tunnel, it will be worth it. I promise. With that said, take some time to reward yourself and play what you like to play for fun. Remember, this is hard work but it should always be fun. Here’s another Christmas song by special request. Silent Night is a fairly easy 3 chord tune in 3/4 time. This version is a finger picked classical guitar arrangement. It’s in the key of G and the chord names and tablature are included in the transcription to help with the fingerings and positions on the neck. Below is a video example of the song. Click here to download the PDF transcription. Enjoy, and let me know how you do. If you have any questions don’t hesitate to contact me. Since the holidays are upon us and I’m getting requests for Christmas songs, I thought I would post a solo guitar arrangement of The First Noel. This is an intermediate level piece as it combines melody and chords, moves into higher positions on the neck, and uses some familiar chord shapes in different locations on the neck. It’s in the key of D and begins with pickup notes on the third beat before the first complete measure of the song. Check out the video example below. 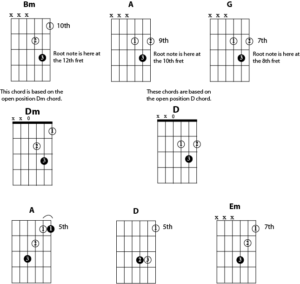 Let’s take a look at the chord shapes in the diagram below. Note that the root notes are shaded in black. Think of the root as being the note that names the chord. If you’ll notice, the three chords in the third measure (Bm, A, G) all have the root notes on the second string. It’s just a matter of placing the shape at the correct fret to get the desired chord. For example the Bm chord has the root note played with the 3rd finger at the 12th fret on the note B on the second string, the A chord right after it has the root note played with the 3rd finger on the note A at the 10th fret on the second string, and the G chord has the root note played with the 3rd finger on the note G at the 8th fret on the second string. 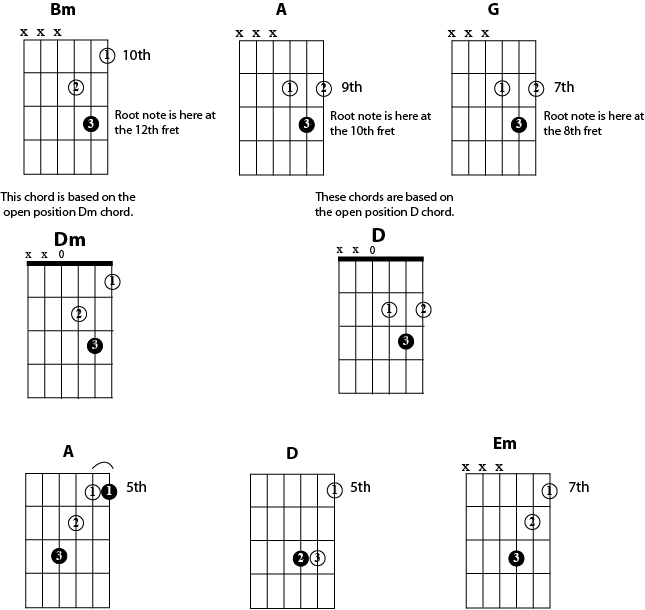 Notice that these chords are all the same shapes as the D and Dm chords that we are already familiar with except that they are played in different locations. Once you realize that shapes and patterns played on the guitar that do not involve open strings can be transposed to different chords, scales, etc… simply by moving them to another location on the neck, it opens the doors to new possibilities and you realize that you actually know more than you think you do. Use this same concept for the chords based on the E shape, such as the A chord in measure 2, and the A shape, such as the D chord in measure 4 and the Em chord in measure 6. Try not to over complicate it. All the chords in the song are just variations of the open position chords that you probably already know. You can play this finger style or with a pick, whichever works best for you. Just remember, the highest notes in the chords are your melody notes so only play what is indicated in the transcription. I have included notation as well as tablature. So, grab an egg nog, your guitar, and take it measure by measure until you can play the whole song from start to finish. Have fun with it, and let me know how you do.